Welding. If you’re new to it, the sheer amount of welding equipment a Brampton welder is exposed to can be overwhelming. Fortunately, you don’t need that much to get started. In fact, we can whittle that list down to just 8 must-haves for every welder. Cart. If you think welding will have you standing in one spot all day, think again. Most welding jobs require you to be able to move around – with your equipment. A rolling cart makes moving your welder and all of its gear a simple matter. Table Or Bench. A sturdy welding table or bench is an essential tool for any type of welding, unless you’d rather contort yourself into all sorts of positions on the floor. For obvious reasons, you’ll want to get a metal workbench. You’ll find benches of all kinds out there, so shop around and think about what you really need in a workbench, you’re certain to find it. Auto-Dimming Helmet. A helmet is a safety must to protect your eyes from heat, gases, sparks, and UV rays. We like the auto dimming helmets because they automatically dim the shield when there is a bright light. This eases eyestrain and helps make it easier to spot the weld joint, even when the mask is down. Bonus: no more flipping the helmet up and down every time you get back to welding. Gloves. Another piece of personal safety gear is a good pair of welding gloves. Welding creates a lot of heat. The heat and UV rays can do some real damage to your skin unless you protect it. Look for high-quality leather gloves that cover your hands and lower arms. Respirator. Shielding gases create dangerous fumes and welded metal can send up debris. A respirator protects your mouth, nose, and lungs from both. Safety Glasses. Hand-in-hand with helmets, gloves, and respirators are safety glasses. Believe it or not sparks and fragments of metal can and do get past the helmet and the last thing you want to happen is for a spark or tiny shard of metal to land in or near your eyes! Invest in a pair of safety glasses to prevent trouble from literally flying up in your face. Welding Clamps. Clamps are handy tools that help keep joints tight while you’re working on the weld. They can be used in many different applications making them one of the most versatile tools in your welding box. They can be used to keep pieces firm, to keep longer pieces straight, or to pull pieces together. Measuring Tools. Carpenters swear by their measuring tools. “Measure twice. Cut once.” Welders should adopt the same philosophy. Eyeballing a weld joint is a surefire way to mess up the job. Welders rely on tape measures, metal rulers, calipers, and metal T-squares to make sure the measurements are right before the welding machine is turned on. Josef Gas is a full-service supplier of welding equipment in Brampton, we carry all the name brands so you can rest assured you are purchasing quality products. Stop in to our showroom at 201 Basaltic Road, Concord, ON to try out some equipment for yourself or to speak with one of our team members. We will get you outfitted with everything you need right away. 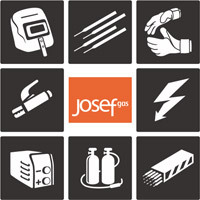 If you can’t make it in to the showroom, call 416.658.1212 or email info@josefgases.com for welding equipment in Brampton.